Four days before Opening Day, MLB has announced its long-awaited suspension for New York Mets pitcher Jeurys Familia after a November 2016 arrest after an alleged domestic violence incident involving his wife. Familia’s 15-day unpaid suspension will cost him 18 days of pay, or about $700,000. Prosecutors in Fort Lee, New Jersey, declined to bring charges against Familia, in cooperation with his wife, Bianca Rivas, who requested the case be dismissed. On the night of Oct. 31, Rivas called 911 and said her husband was “drunk” and “going crazy.” When officers responded to the call, they noted that Rivas had a scratch on her chest and a bruise on her cheek. It was later determined that the scratch on Rivas’s chest was caused by their son, not by Familia. Additionally, Familia will “speak to other players about what he has learned through this process” and be involved with local domestic violence organizations. MLB’s domestic violence policy allows Commissioner Rob Manfred to use his discretion in determining a suspension under the 2015 domestic violence policy agreed to by the league and the MLBPA. The policy is not contingent on a legal outcome from an incident, but in previous cases, as with this one, the league has waited to see where any prosecution goes. The goal of that policy is clearly to allow for nuance, and Familia’s suspension, coupled with counseling and opening a dialogue with his teammates is a reflection of that goal. Previous suspensions include Hector Olivera’s 82-game suspension for domestic violence (Olivera was later convicted, and dropped an appeal on the charge); Familia’s teammate on the Mets, Jose Reyes, was suspended for 52 games in 2016, following an Oct. 31, 2015 incident involving his wife (the case was dismissed when Reyes’s wife declined to work with prosecutors); and Cubs closer Aroldis Chapman was suspended 30 days in 2016 following an Oct. 30, 2015 incident where he fired a gun eight times in his garage at his home in Florida after allegedly assaulting his girlfriend (no charges were filed). The pitcher said that he has “taken meaningful steps to assure that nothing like this will ever happen again,” and apologized to the Mets and their fans for his conduct. 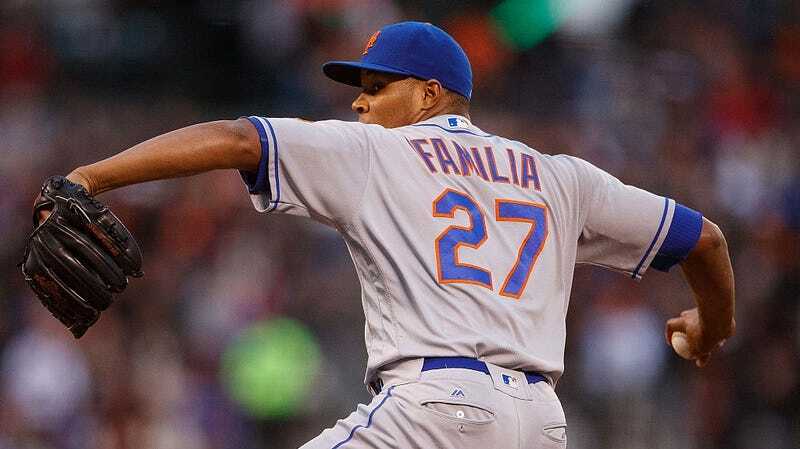 Familia participated in spring training with the Mets, and pitched for the Dominican Republic in the World Baseball Classic. The MLB season begins Apr. 4. Familia will return to the team for the Apr. 20 home game against the Philadelphia Phillies.